Standing tall and strong at the crossroads of the busy shopping and crafts lanes of Sannen Zaka and Ninnen Zaka, half way from Yasaka shrine, and Kyomizu Temple, the Yasaka Pagoda is also known in Japan under the name Honkan-Ji. I had spotted this stunning and elegant building while exploring the Higashiyama district on the previous day, for my shooting session near Kyomizu Temple. June 2015, panorama from 3 vertical images, additional exposures for highlights, focal length 35mm, aperture f/11, shutter speed 0.5 seconds, ISO 100, tripod, pano head. Built and destroyed in many occasions, the current earthquake proof building dates back to 1440, although the 46 meter high pagoda was inspired by a dream to Prince Shotoku in 589. It is one of the most ancient towers in Kyoto. It is composed of a very powerful oscillating mechanism to resist the strongest earthquake. For many Japanese artists, wood sculptures, it is a motif very often used to represent Kyoto, the ancient Japanese capital in prints and Ukiyo-e. I set up my alarm for an early call, around 3am. The morning was chilly and overcast. I headed towards the residential area of Gion. 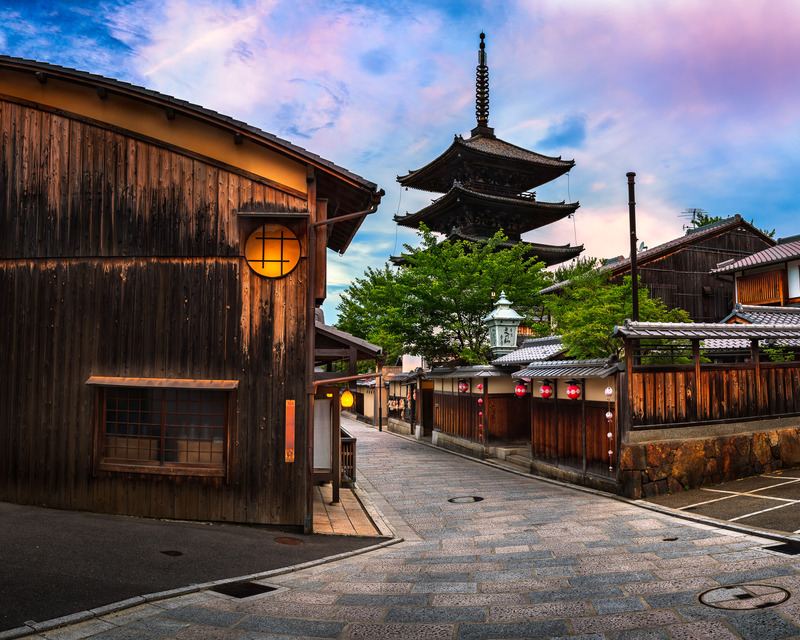 I arrived slightly later than I had wished, but the sunrise lighting on the ancient wood houses and Yasaka Pagoda was still incredibly nice, giving a soft and romantic touch to the sacred tower, and its surroundings. I worked before the morning light reached its best to choose the panoramic composition I had dreamt of for this particular spot and to express the most of the mood of the moment. After I set up my equipment and fine tune the shot, I could feel the magical light on the old tower. I almost expected an apprentice maiko to appear and walk past on her way to a tearoom, such a special time in a deserted Japanese lane.